If you are in to babywearing you may have heard chatter amongst your babywearing friends about turning 120-inch Mahogany Cotton Tablecloths into a short wrap. Well, I decided that I would try it. 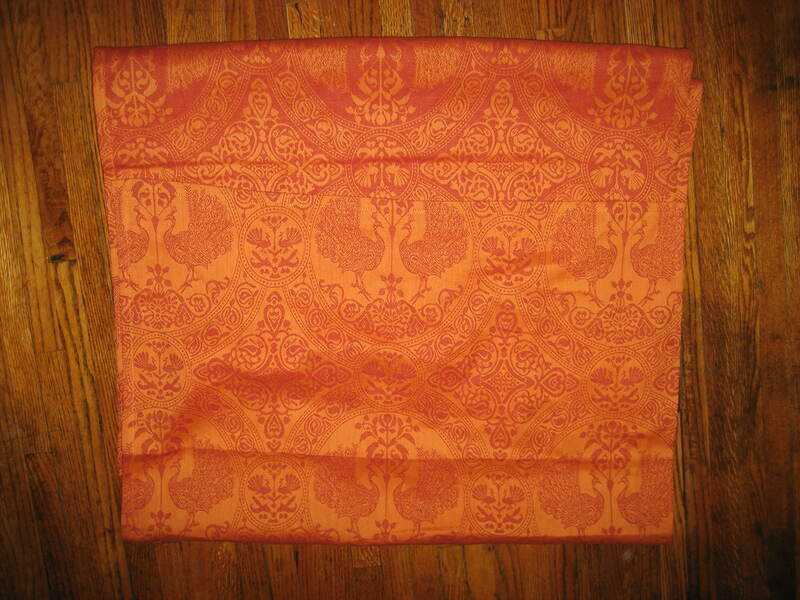 I ordered the peacock, orange/red tablecloth linked above (affiliate link – Disclosures/Disclaimers here.). Cut it in half. Ironed, rolled and hemmed the cut long end. Added a middle marker. And I now have 2 short wraps. And I was able to sell the second one to a local friend and recoup 80% of the retail price that I paid to begin with. My shorty only ended up costing me $10 and some time in the end. Not too bad. 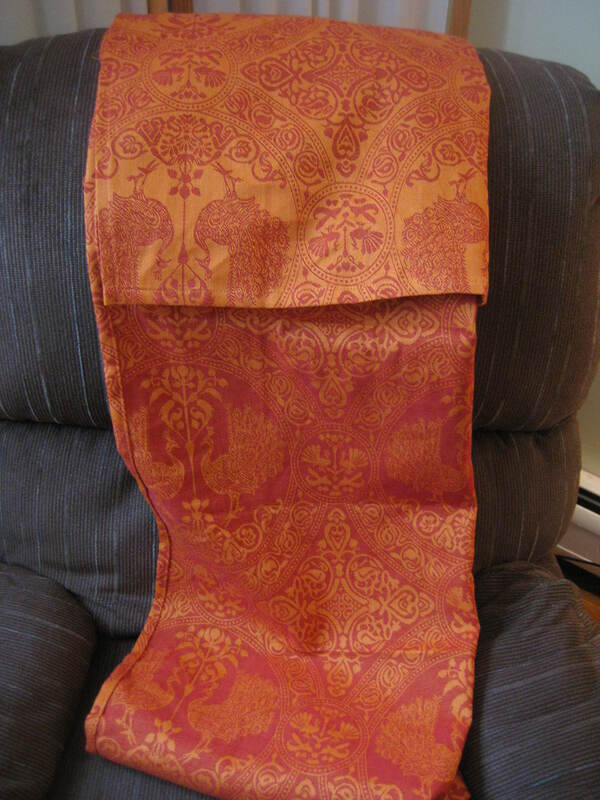 So, if you have some sewing skills, getting a nice, quality, woven wrap doesn’t have to be expensive. Any sturdy, woven, cotton tablecloth will do. Shop your local stores for clearance items (Target often has good linens on clearance). Look for tablecloths that are all cotton (cotton/linen blends will do, but avoid all synthetic fabrics). You do not want a “printed” tablecloth. You want one that does not have a wrong side. 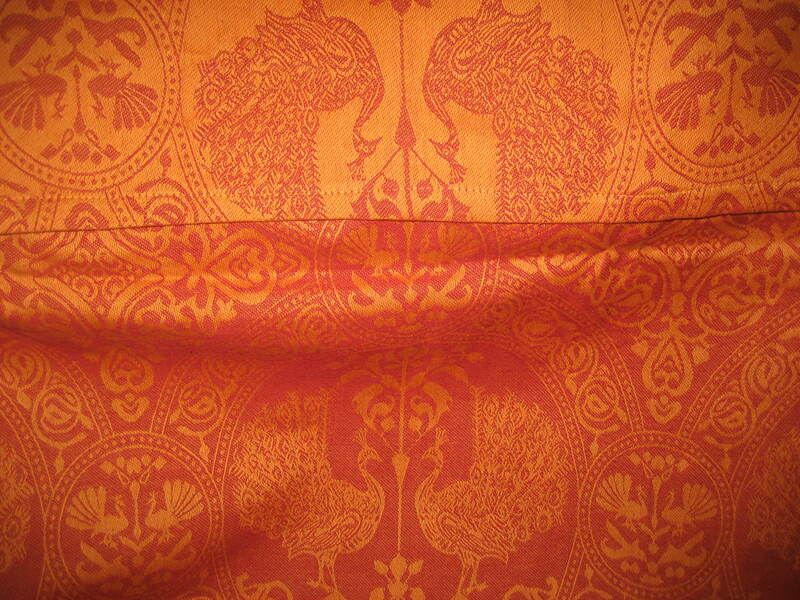 Jacquard and damask weaves are good. You should be able to see the weave and the reverse weave on the other side. The ideal length for a shorty is a 60×120″ tablecloth. Then you have an 30″ width for each wrap once you cut the tablecloth in half length-wise and you can do several shorty carries with this length. A 90″ tablecloth will allow you to make a ring sling or do rebozo carries If you want to explore DIY baby carriers further look up DIY Babywearing Advice and Support on Facebook. 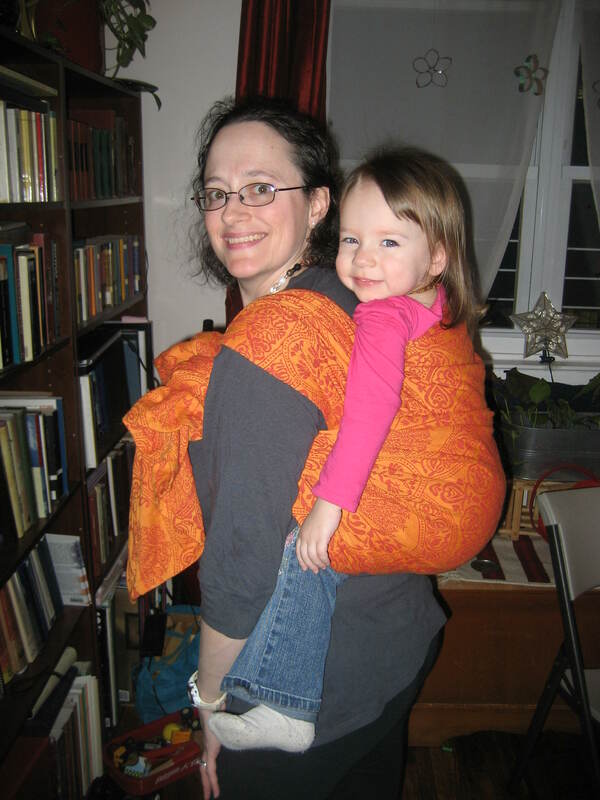 This entry was posted in Babywearing, Recycled Sewing. Bookmark the permalink.